At the age of sixty-one and twelve years after his last film in the role of James Bond I imagine Pierce Brosnan doesn't necessarily want to be starring in second rate excursions of Bond movies as someone called Peter Devereaux. I imagine he'd like to be making more calm, thought-provoking dramas or interesting character pieces, but that just doesn't seem to be in the cards for the poor guy. He seems to have tried his hand at making low-risk romantic comedies and dramedies all of which have seemed to fail to give his career any kind of life after his exit from his most famous role. He has played in this genre before outside of the Bond franchise with 2005's little seen The Matador, but not since have we seen Brosnan so blatantly admit to audiences that he misses playing the British Secret Service Agent. He would seemingly like to be a well-regarded leading man in more mature fare, but it is likely he sees no other options in maintaining his relevancy and so we will continue to get things such as The November Man (I hear they're already moving forward with a sequel to this!) until he finds a role that will earn him an Oscar (though admittedly probably much later in his life) that will leave his legacy as something of a real cinematic presence and not just as the guy who once played James Bond. That would be the ideal way for things to go, but if he is determined to live in the now rather than with some sense of perspective he may pigeon-hole himself into the guy who never got over being Bond. It is easy to see Daniel Craig moving on after his term in the suit (despite the fact his non-Bond efforts have either failed commercially, critically or both since taking over the role), but that is an article for another day. Now, we are here to discuss The November Man and the merits of being a late-August release and how the fact this is a film as generic as anything we've seen this year will still get a passing nod because there simply isn't much else going on. I like Brosnan, I always feel I'm rooting for him and I found myself doing that here even though, every few minutes, I had to ask myself where these characters were, where they were going or what exactly they were doing to further the plot. It's that kind of movie, but when the credits roll you shrug it off an move on, no harm done. Peter Devereaux (Pierce Brosnan) consults his apprentice, Mason (Luke Bracey), on his tactics. From a novel by Bill Granger titled There Are No Spies, The November Man (which takes its title from a nickname given for reasons not all that clever or clear) begins by dropping us in the middle of a mission where Devereaux is training his latest pupil, Mason (Luke Bracey). They are attempting to stop a political assassination, but this latest apprentice has a problem taking orders. Flash forward a few years and Devereaux is now retired, but called back into action by old friend and high level CIA official Hanley (Bill Smitrovich) for a mission that involves him getting some extremely sensitive information into Hanley's hands as he is the only one Hanley can trust. In the middle of the job events transpire and Mason just happens to be on the other end of Devereaux's spectrum causing them to cross paths, each weary of why the other is involved with the seemingly opposing team. One would imagine that the film would latch onto the tension within this reunion between old master and the once apprentice who is now hotshot agent himself. Instead, this one intriguing factor about what is otherwise an, as I said before, generic action thriller is thrown by the wayside in order to make room for plot-heavy dealings in political corruption that have something to do with Devereaux's high-ranking CIA official friends and a Russian president-elect named Federov (Lazar Ristovski). Within the convoluted story we are introduced to Alice (Olga Kurylenko) who is critical to both Mason and Devereaux as they race to find her so that she may divulge some kind of insight on a girl she once had communications with that was linked to Federov. Mason is ordered to apprehend Alice, a silent Russian agent named Alexa (Amila Terzimehic) is looking to kill her and Brosnan's Devereaux is simply trying to get to the bottom of things while plotting revenge against Mason for killing a fellow agent whom Devereaux had close ties with when the two came together unexpectedly in the beginning. It's all a bunch of this person vs. that person, teacher vs. apprentice, unsuspecting victim vs. killer Russian, CIA vs. Devereaux until it comes back full circle and we wonder what the point of it all was. In short, it's all a bit much, a bit overkill. There is a conflict of interest in that the majority of the time the film feels like a straightforward adaptation of an airport spy novel that plays towards the standard expectations of that genre while other times acting like it wants to be something more. There are certain elements of Roger Donaldson's (The Bank Job) film that suggest a little more integrity. There is a certain aesthetic to the proceedings that make it look like a Steven Soderbergh or David Fincher film while also being distinctly European in nature. There is a hint of throwback, of 70's rough and tumble, narrow point of view mentality that wreaks over the proceedings, but then of course the feelings are derailed by the actions of the characters or the unnecessary complexity of the plot. It isn't boring, but it certainly isn't very efficient and that is where disposable distractions of entertainment such as this shouldn't flounder. The more lies, secrets and tortuous the events become the more torturous the effect is on the audience. The film becomes so wrapped up in the layers of lies and corruption within the CIA that who we are intended to believe is the real bad guy becomes little more than an afterthought. Subplots are pushed to the backburner and gunfights go off without any sense of repercussion or psychological effect on those constantly killing for their paycheck. Bodies are dispensed with such ease in the film it makes not only the characters seem soulless, but the movie as well. There is a scene in which Mason takes out a girl and then beds her only to have her life end up in a hospital bed while never returning to this story strand to let us know if she lived, if there was any actual emotional connection there or if Mason really had learned all the tricks of the trade from Devereaux. Let's not even get into discussions about a certain someone's daughter coming into play late in the game and existing solely as a function of the script so that there might be a final showdown that's intended to hold tension, but rather exists as an empty shell both because we know what's coming and we have no investment in the relationship on the line. 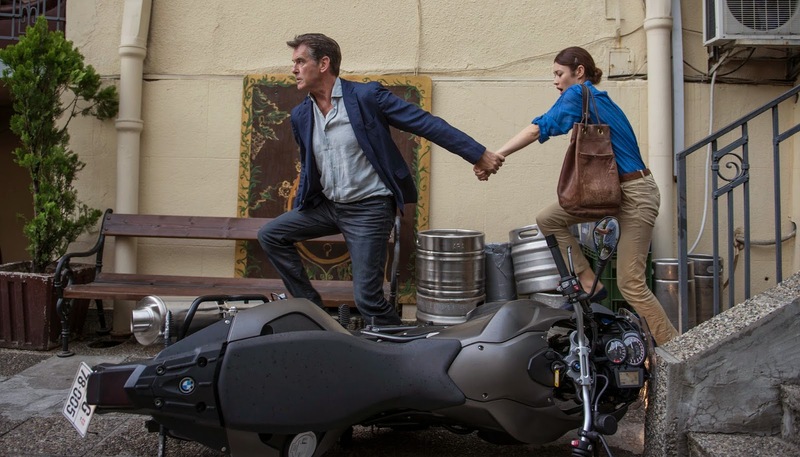 Devereaux leads Alice (Olga Kurylenko) through one of many shoot-outs in The November Man. As I sat, taking in The November Man, I began to question what was it about this character that made him deserving of his own film. Was there anything? Were there any characteristics that set him apart? Anything that made him more interesting than the spy sitting next to him? We're never given much background and don't know that he is necessarily exceptional with his skills and so we are left to wonder: why Devereaux? As I said before, the one differentiating factor with this film was the built-in tension between the former master and apprentice, it is the hook, the thing that makes the audience believe it might have somewhere interesting to go, but instead the film isn't even smart enough to put the emphasis on this relationship. It could have even been as simple as something like a former operation from the past coming back to haunt the two of them and they reunite, but have to again work through their differences to overcome this past mistake. It could have been something that put the focus on why Devereaux chose the methods he did, why he thought Mason wasn't a good fit for the role and how he failed in his eyes. When forced back together though the old curmudgeon could come to realize there is more than one way of doing things and their two different, but equally effective methods still get the job done-a lesson in equality of thought is learned and is certainly valuable as, in the film we do get, these unaccepting blunt instruments refuse to accept anyone else's opinion. There are several different ways they could have come at this, but in the Bond/Bourne mashup we do get there is too much plot overriding what should be an easily conveyed thriller or series of tropes. The film wants to hint at something bigger, just as Donaldson does artistically, but the motivation of turning our world from a war of east vs. west to one of the civilized world vs. the middle east isn't given the right amount of due diligence in its execution to reach such a conclusion. 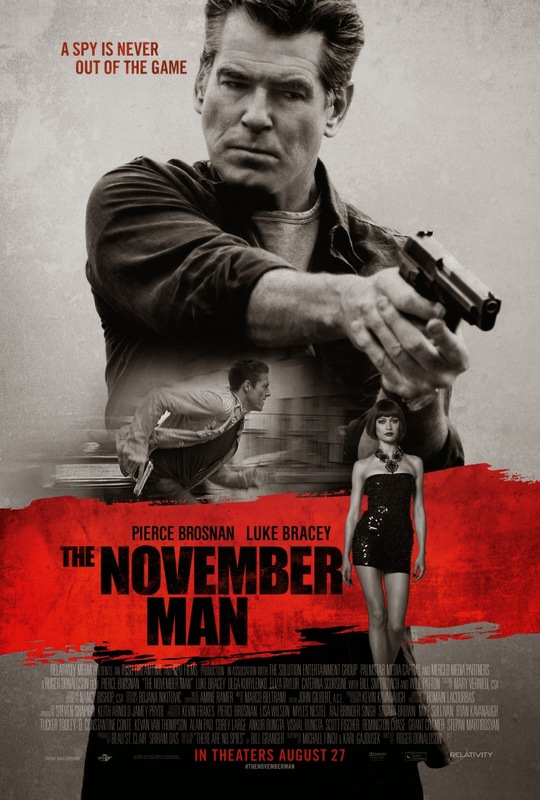 The November Man refuses to accept what it really is and though I appreciate it's ambition, by overstepping its boundaries it becomes a film you don't feel but a mess you will forget even exists.